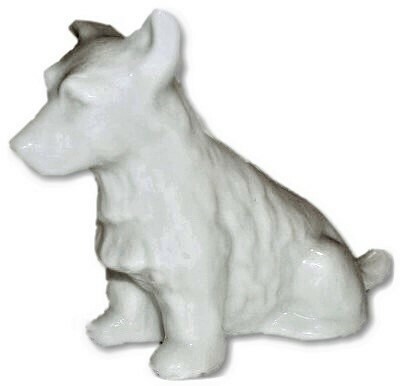 Irish Belleek terrier! 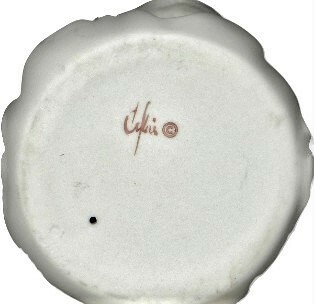 Measures 3 1/4" X 3" and is marked on the base with the gold mark which dates from 1981-1992. No chips, cracks or repairs. 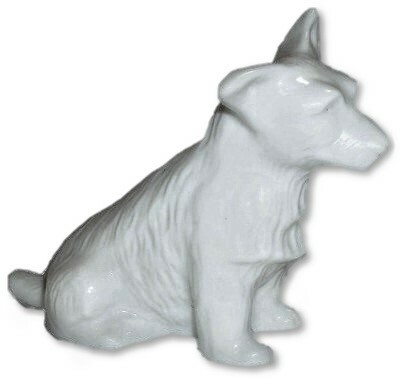 Irish Belleek Porcelain terrier. 3rd Green Mark which dates from 1965-1981. The Terrier measures 4 1/2" X 3 3/8". No chips, cracks or repairs. 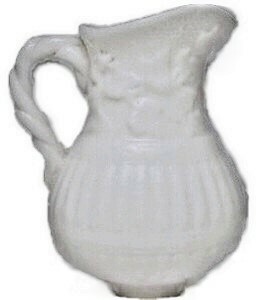 BENNINGTON POTTERY miniature parian ware pitcher. Measures 2 1/2" X 2 1/4". There appears to be a small flat possible in the making flake from when the item wall pulled from the mold on the bottom edge, it is so smooth and appears to be under the original glaze. There are no other condition issues. 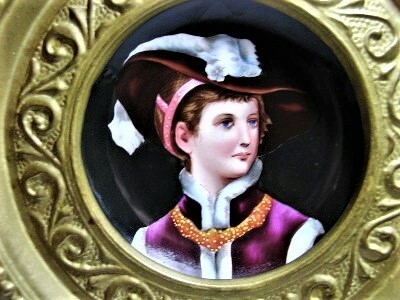 CAPODIMONTE Italian Porcelain BORGHINI LACRIMA CHRISTI GARNIER military figural bottle. 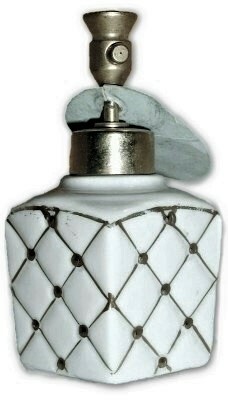 The Napoleon Bonaparte insignia is prominently displayed upon the front of this bottle. 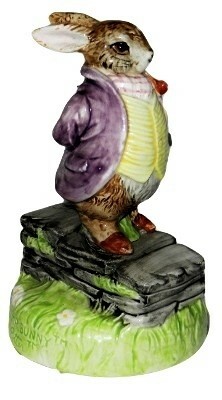 Standing at 13" tall and a square base measuring 3 1/2" X 3 1/2". The bottom also has a company logo in the raised mold. 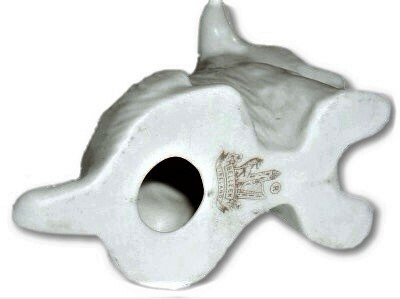 The original stopper appears to be pushed down into the neck. No chips, cracks or repairs. 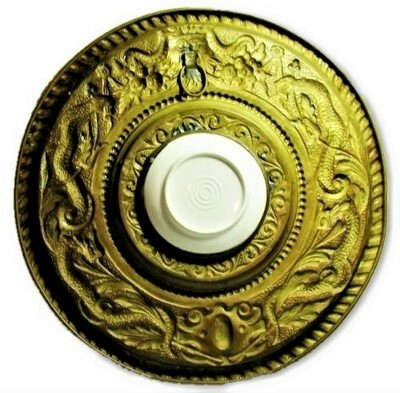 ANTIQUE BRASS AND HAND PAINTED German PORCELAIN INSERT FLUE COVER. 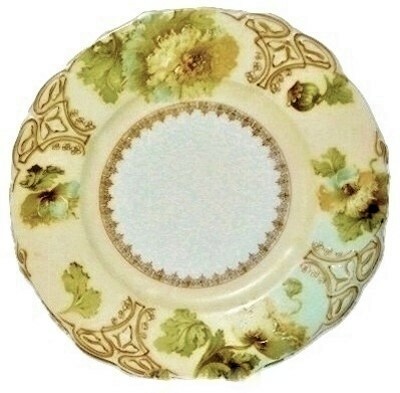 This beautiful item measures 12" across the brass frame while the Hand Painted Porcelain Dish insert measures 3 3/4" across. Circa 1900. 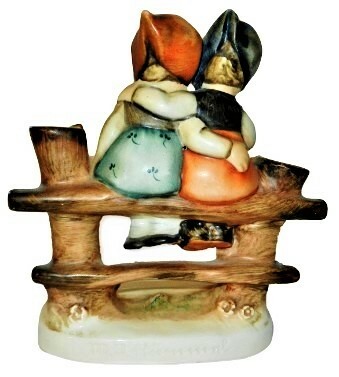 This item is most likely of Austrian or German origins and in the style of KPM Porcelain. All original condition! No chips, cracks or repairs. 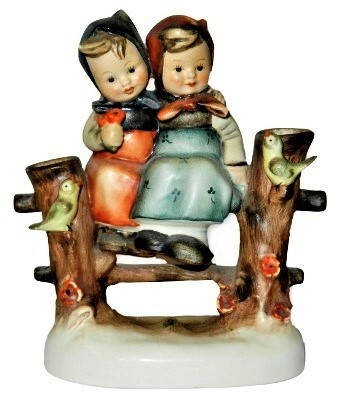 Duckling ‘Baby Brother’ was an open edition from 1962 to 1979 and stands 4.5”high. Initially priced at $35 by Cybis, he was $95 at retirement. Supposedly this is a baby merganser according to the 1965 Cybis catalog, but merganser ducklings are heavily colored, not white. No box, no chips, cracks or repairs. 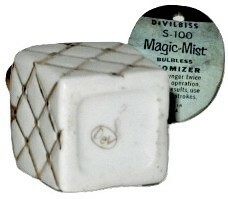 Marked and tagged "DEVILBISS MAJIC-MIST" porcelain perfume atomizer! Stands 3 1/4" tall and 2" across at the widest point. Marked on the base DeV within an oval and it also retains its original tag which reads Devilbiss s-100 Majic-Mist Bulbless Atomizer as well as directions on how to use the atomizer. No chips, cracks or repairs. FRANKLIN PORCELAIN artist initialed MDS and dated 1977 Wedgwood Blue & White JASPERWARE Porcelain Plaque. The reverse side of the plaque is covered with the original back paper/cardboard liner and the porcelain is impressed "@FP 1977" The original frame is in excellent condition and ready to be hung. 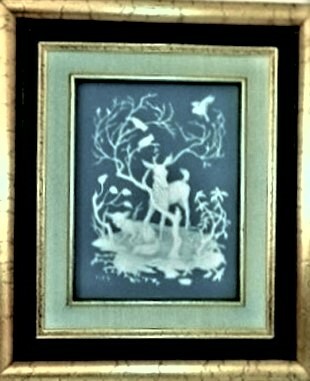 The frame measures 11" X 9 1/2" and the porcelain plaque measures 6" X 4 3/4". No chips, cracks or repairs. Germany Schafer & Vater style bisque dresser box. 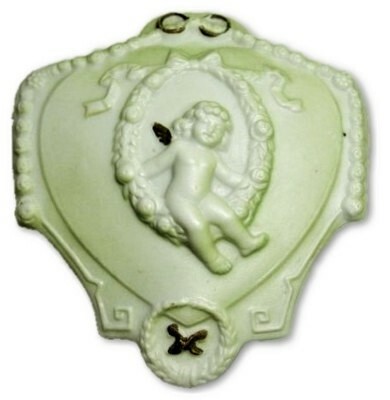 Decorated in low relief and displays a full winged cherub among floral wreaths and the sides of the bottom of the box are decorated with friezes of clover bunches and four leaf clovers. Measures 3 3/4" X 3 1/4" X 2 3/8". The base is impressed "7128. 1. GERMANY." 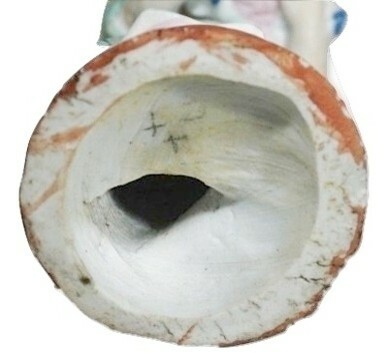 There is one extremely tiny flea bite flake inside the base rim which we believe was created during the manufacturing process. No chips, cracks or repairs. 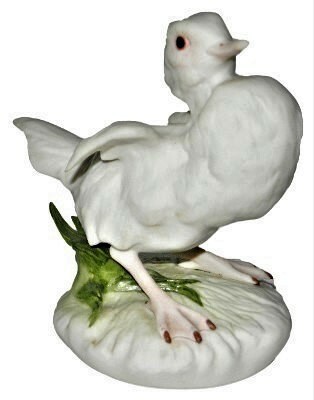 GOEBEL M.I. 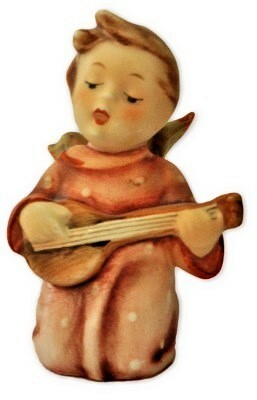 Hummel "ANGEL SERENADE" Nativity figure. The small stylized V and Bee W. Germany TMK-3 mark is surely present underneath the original TMK-3 foil label on the base. Measures 3". No chips, cracks or repairs. 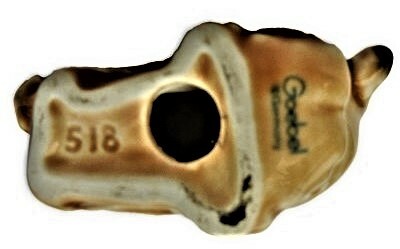 GOEBEL M.I. HUMMEL "COQUETTES" impressed shape 179 along with TMK-2 Full V and Bee mark. Measures 5 1/4" X 4 3/4" X 2". There are the tiniest rubs/flea bites to the tips of the birds tail feathers. No other chips, cracks or repairs. 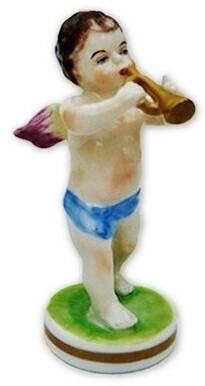 GOEBEL M.I. 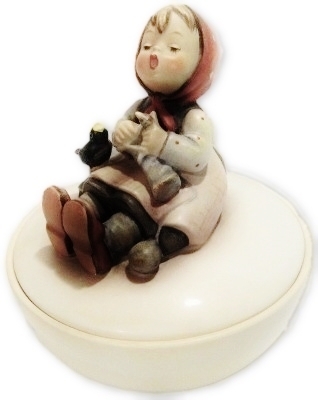 Hummel HAPPY PASTIME "Old Style" Covered Box Bowl. The small stylized V and Bee W. Germany TMK-3 mark is present on the underside. Measures 6 1/2" X 5 1/2". There is only very fine light crazing, No chips, cracks or repairs. 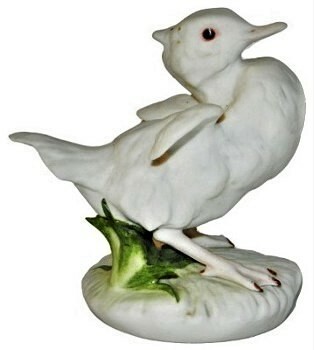 Goebel, M.I. Hummel "NORTH WIND" shape 43 TMK-2 full V and Bee with black GERMANY. 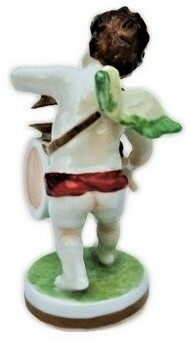 Stands 5 1/2" tall. No chips, cracks or repairs. 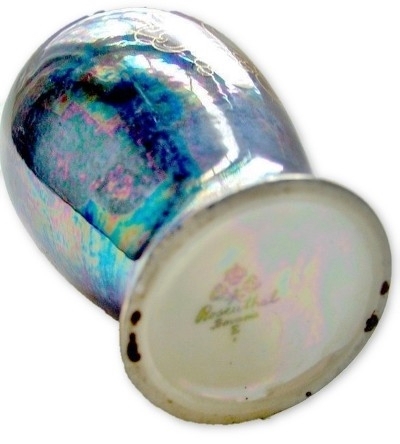 E&A Bockling "GOEBEL" porcelain figure wine glasses with wheel engraved crystal embellished with 14kt. Gold. Each stem measures 5 1/2" X 2 5/8". The wheel engraved design is of grapes, leaves and vines. 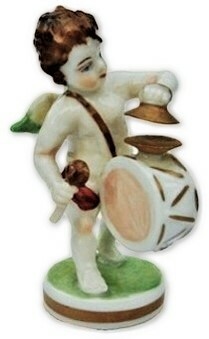 The foot which the porcelain figures stand upon all have a light iridescent amber finish. Unsigned, no chips, cracks or repairs. 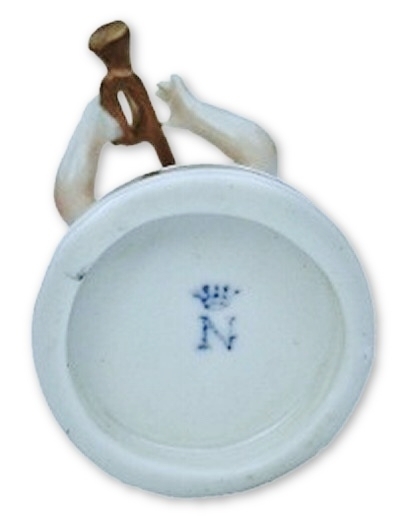 Heubach porcelain figure of a young girl in a blue bonnet holding her doll. Measures 7 1/2 " high and has several small flakes off on the base rim. No other chips, cracks or repairs. German Art Nouveau Gebruder Heubach White on Mauve Pate Sur Pate Fairy vase. Measures 5 3/4" X 3 1/2". 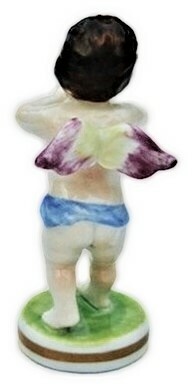 The figure of a Fairy in long flowing dress along with her extended Fairy Wand and wispy wings. Marked on the bottom as seen in our image. There is some interior rim wear to the gold embellishment as well as some light wear to the gold accents on the exterior. No chips, cracks or repairs. 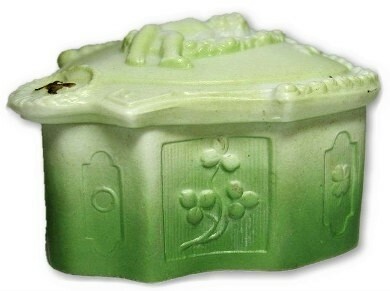 Marked Made in Italy green porcelain perfume atomizer! 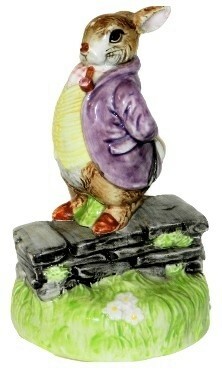 Stands 6 3/4" tall. 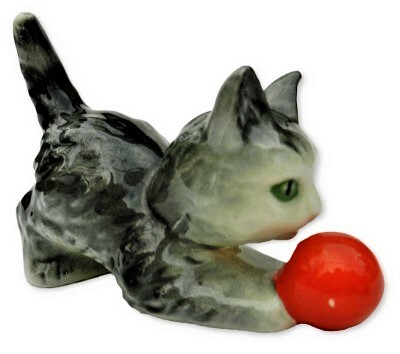 The original hardware is intact and the original bulb will need to be replaced if you wish to use this item otherwise it is completely intact for display purposes. No chips, cracks or repairs. JUGENDSTIL, Art Nouveau Vase. This low relief designed vase has 2 extremely detailed flying Putti with trails of smoke and beard from the stunning figural handle with the face of the man in the moon in low relief and equally fine detail. 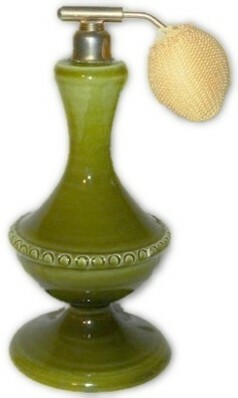 The vase stands 10 1/2" tall and measures 4 1/2" across at the widest point. 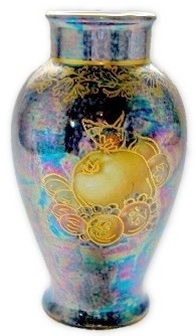 The back of the vase has a very small area where the glaze has a somewhat orange peel texture. 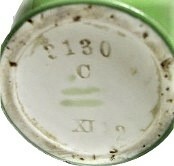 The base has a number of marks which include "3130 C (two horizontal line with a dot above in green) XI 2". No chips, cracks or repairs. 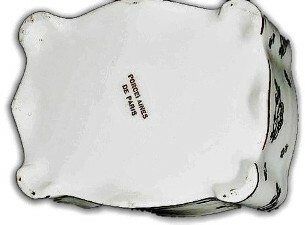 Pate Sur Pate box marked "Porcelaines De Paris". 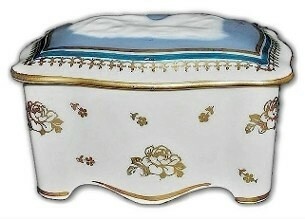 Early 20th century box is of white porcelain, covered with gold roses and a lid decorated in gold, cobalt blue and a stunning white Pate Sur Pate cameo under glaze bust of a woman on a blue background. Artist signed TOM and has a gold hand painted G on the interior lid as well as the interior of the base. Measures 4"X 3 1/2"X 2 1/4". There are no chips, cracks or repairs. 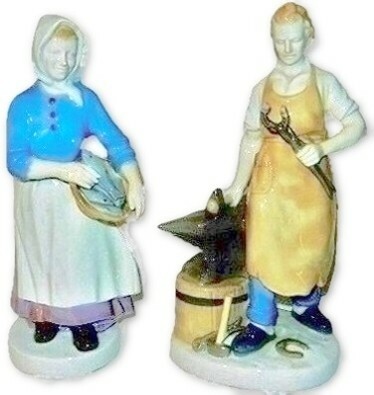 Porzellanfabrik Carl Scheidig tall figures of a male blacksmith and a scarfed woman carrying a basket of fish. Both items are marked as shown in our image. The blacksmith measures 10" X 5" X 3". The companion fish wife measures 9 3/4" X 4" X 3". The mark on this pair dates from 1935-1972. No chips, cracks or repairs. 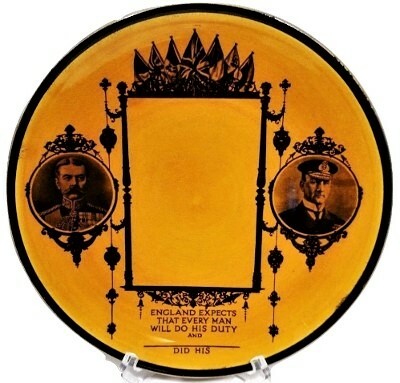 This is a memorial and commemorative plate made during WWI. It features on the right the "Admiral of the Fleet, The Earl Jellicoe" and on the left "The Earl Kitchener" a senior army office who achieved great fame on the battlefield. Marked; Ridgways, England and was to designed with an area outlined for the memorial image of one who had performed his duty and a space for his name below. The famous motto is also present quoting "England expects that every man will do his duty" was a signal sent by Vice Admiral Horatio Nelson, 1st Viscount Nelson, from his flagship HMS Victory. Measures " across. No chips, cracks or repairs. 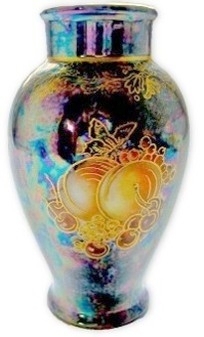 20th Century "ROSENTHAL BAVARIA" Porcelain, Fruit and Butterfly Luster Vase. 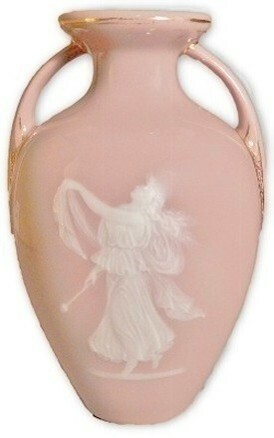 Very similar to those produced by Wedgwood, this stunning Rosenthal Luster Vase is in wonderful condition. There is no wear to Gold decoration or the stunning iridescent finish. 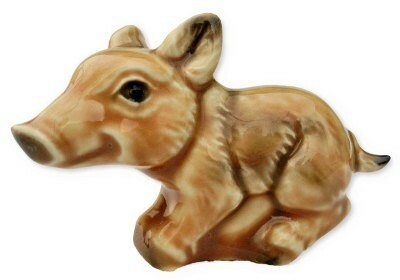 This item stands 5 1/4" tall and 3" across at the widest point. 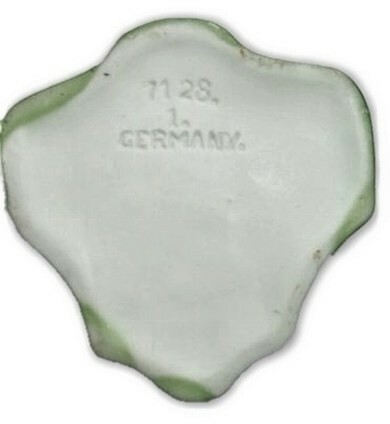 The base is stamped ROSENTHAL BAVARIA E. No chips, cracks or repairs. 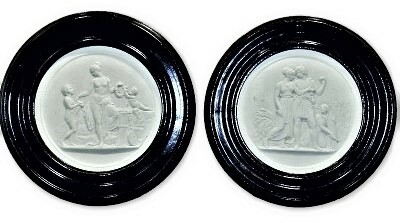 PAIR of Royal Copenhagen Bisque Porcelain Plaques! This pair of Neoclassical relief plaques have beautifully detailed figures as their decoration and are set in their original unopened Mahogany Wood frames. We have previously sold plaques like these out of their original frames and each was marked with the blue Royal Copenhagen wave mark on the back as we are sure this set is as well, though we will not remove them from their original frames or paper to determine this. We do guarantee completely that these plaques are as represented. 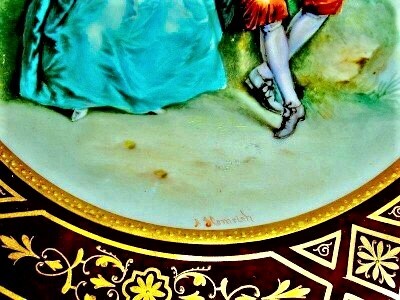 Each porcelain plaque should measure @ 5 1/2" while in the frame they measure a total of 8 1/2" across and 1" deep. No chips, cracks discoloration or repairs. 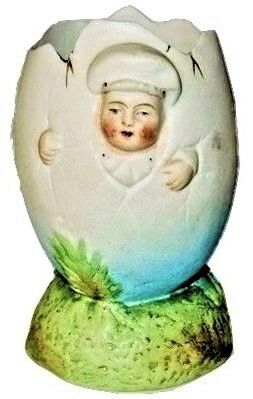 Royal Rudolstadt Germany fine bisque porcelain blue hatted boy breaking free from an egg shaped toothpick holder. Fully marked on the underside with the Royal Rudolstadt RW Germany crest, impressed G 714 14. Measures 3 3/4" tall and 2 3/4" across at the widest point. A very small possibly from the manufacturing process bottom rim flake. No other chips, cracks or repairs. 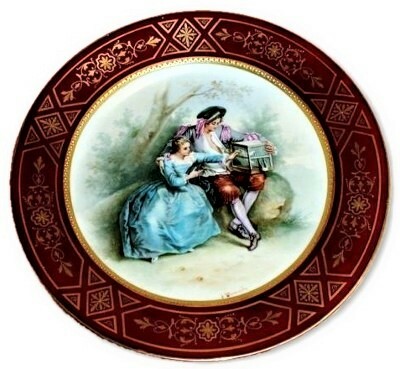 Artist Signed and Marked Vienna/Carlsbad Beehive Austria Hand Painted Plate. This beautiful item is Artist Signed "A. Slemrich". 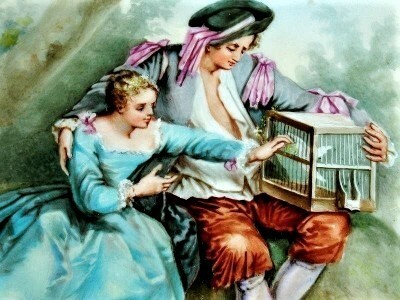 The plate is Hand Painted with a lovely Couple with a White Dove within a Bird Cage. 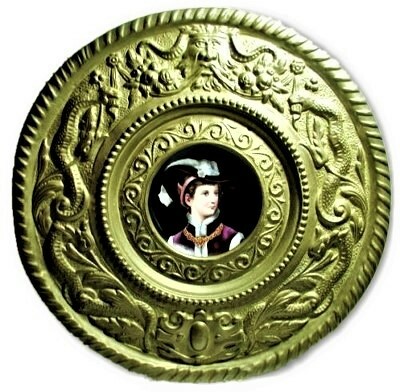 The outer rim of the plate has Fantastic Hand Painted Gold over a Maroon Ground. 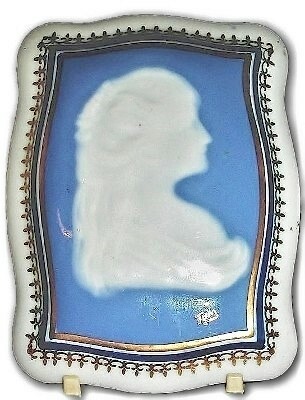 The reverse of the plate is impressed Carlsbad and a hand painted Blue Beehive Mark. The plate measures 9 1/2" across. There are no chips, cracks or repairs. ANTIQUE MARKED *RS SUHL hand painted R S Germany* set of 6 MATCHING Handled Sauce Dishes. 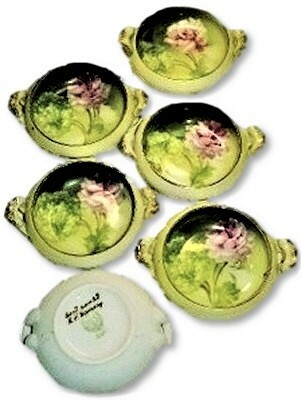 Each item is decorated with Pistachio colored Hydrangea and Pink Wild Roses on a soft Green/White ground. 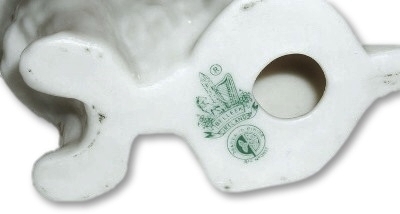 The reverse side of each item is marked, some with the under glaze GREEN RS SUHL Wreath Mark, Some with the words "hand painted R S Germany" while some have both of these marks as shown in our image. There is no question that this set began life together and we wish for them to continue this tradition. Each item measures 3 3/8" across and sit 1 1/8" high. There are no chips, cracks or repairs and any wear is so minor that it is virtually not seen with the naked eye. 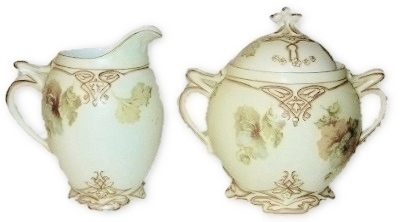 Antique "OLD IVORY" Silesia Clairon XV pattern, creamer and sugar set. The creamer measures 4 1/2" X 4", the sugar measures 5" X 5". No chips, cracks or repairs. Antique "OLD IVORY" creamer and sugar set. The creamer measures 3 1/4" X 4 1/4", the sugar measures 4 1/2" X 5". The sugar has a tiny flea bite flake on the top edge smaller than the head of a pin. No other chips, cracks or repairs. 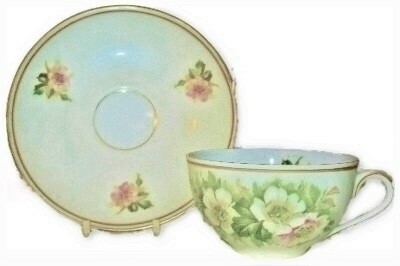 Antique "OLD IVORY" cup and saucer set. 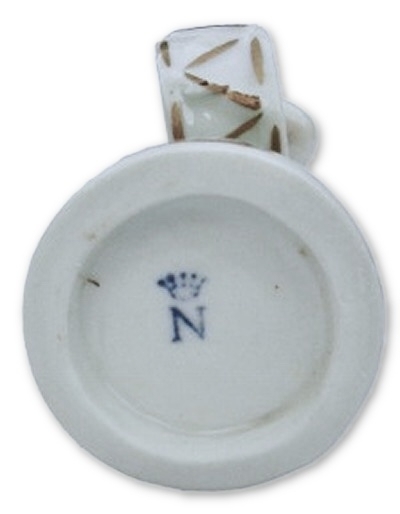 The cup measures 2 1/2" X 4 1/2", the saucer measures 5 1/4" X 1". No chips, cracks or repairs. 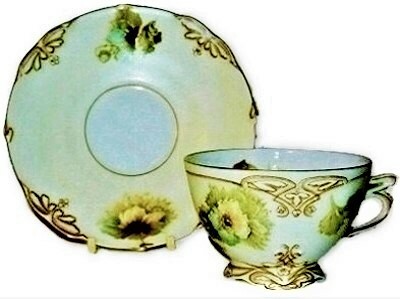 Antique "OLD IVORY" Silesia Clairon XV pattern, cup and saucer set. 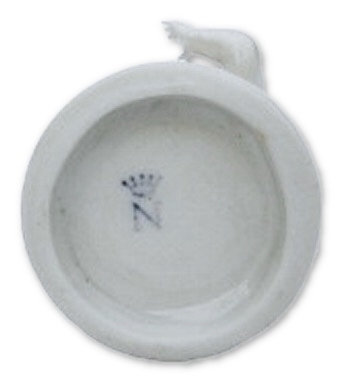 The cup measures 2 1/4" X 4 1/8", the saucer measures 5 1/2" X 7/8". No chips, cracks or repairs. 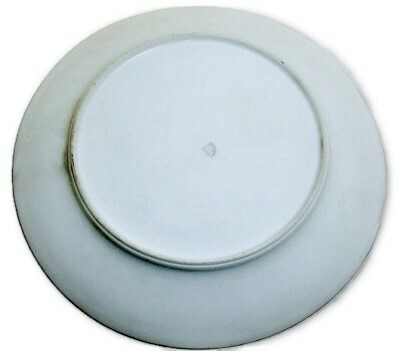 Antique "OLD IVORY" Silesia XV pattern 7 1/2" plate. No chips, cracks or repairs. 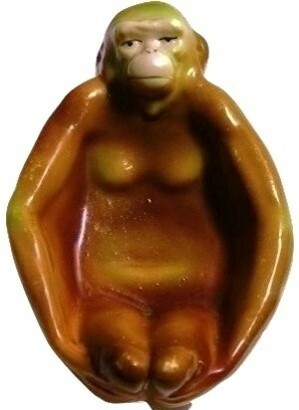 GERMAN PORCELAIN figural MONKEY Pipe Rest Pin Tray. This item has an illegible series of marks impressed under the item. This form is known to be made by SITZENDORF as you can find similar versions on the internet with legible marks shown. 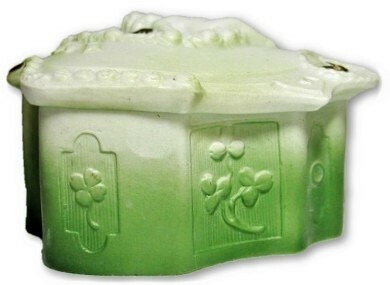 The item measures 4" X 2 5/8" X 1 3/8". The item is much nicer in person than our image appears. There is only light use wear to the finish and no chips, cracks or repairs. WEDGWOOD & BARLSTON made in England ETRURIA MOONSTONE SANDEMAN SCOTCH FIGURAL BOTTLE. 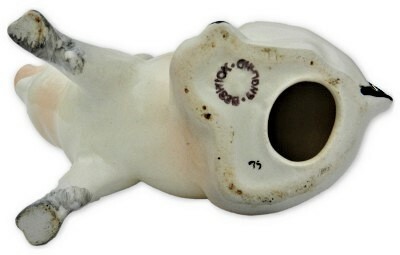 This item has its original reverse side paper label while it is lifting from the ceramic surface and has some minor creases it is intact. The cork and top are missing. 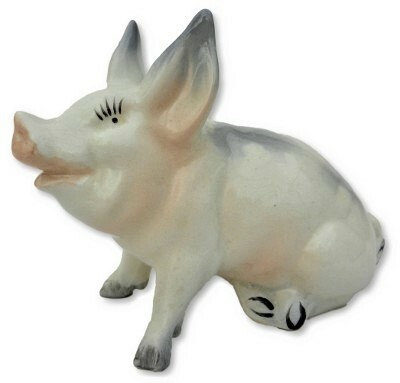 This item stands 10 1/2" tall. No chips, cracks or repairs.